Swelling of feet, also called edema is common problem that can occur due to many reasons. It is usually a symptom of underlying issue like high blood pressure, pregnancy, overweight, aging, standing or sitting for a longer period, nutritional deficiencies, poor blood circulation, and premenstrual syndrome and common injuries. Swollen ankles or feet usually occur when too much fluid gets stuck in the muscles and body is having trouble to move blood and fluid back to the legs. Weakness of the leg veins, lymphatic drainage problem and heart and kidney problems are some other reasons for swollen feet and ankles. With rise in life-style diseases like diabetes and heart disease, edema has become a common problem. It can be sometimes very painful with symptoms like redness and inflammation. Soak your feet alternatively first in cold water and then in warm water. Fill one tub with cold water and the other with warm water. Soak your feet first in warm water for 4-5 minutes and then removing from water, immediate soak your feet for one minute in cold water. Continue doing this for 15-20 minutes. Warm water will help to improve circulation while cold water will help to reduce swelling and inflammation. A quickest way to reduce swelling of feet and ankle is to elevate them. Inverted gravity can be a great remedy for reducing swelling. Elevate your legs up with the help of some pillows will help to decrease swelling. Ideally your legs should be on a higher surface above the heart. Elevating the legs will help to encourage the excess fluid to drain away and get absorbed or eliminated via urine by your body. This you will have to do several times a day to improve your condition. Soaking your feet after adding Epsom salt in a tub of water is another great way to reduce swelling and pain. The magnesium sulfate contained in Epsom salt will get absorbed through the skin and help to encourage blood circulation and reduce swelling. 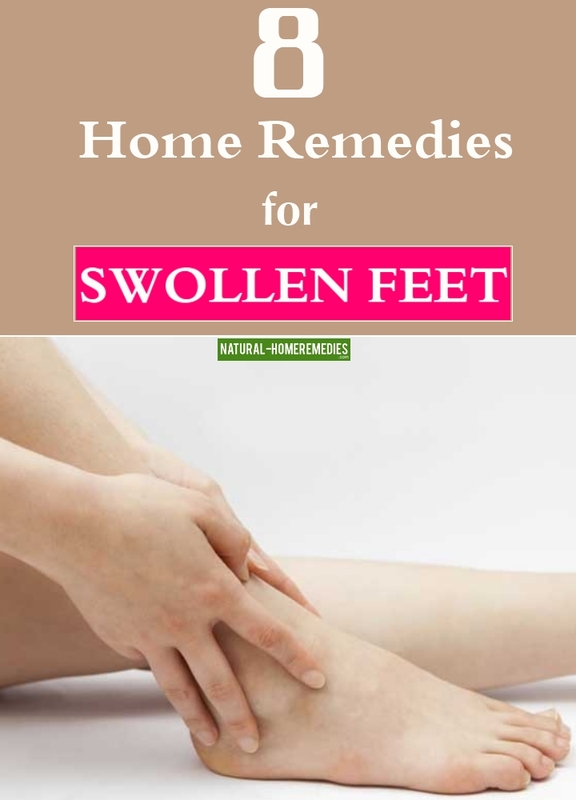 Soak your feet in this solution for a minimum of 15-20 minutes to get relief from pain and swelling. Gentle exercises or yoga postures will help to encourage blood circulation and stop retaining fluid in your ankles and feet that results in uncomfortable swelling. Simple postures like flexing and extending the toes and the feet, inversion postures in which you elevate the feet above the heart or putting your legs up against the wall lying on your back will help to reduce pressure on the feet and ankles and reduce swelling. A foot massage is very relaxing for reducing swelling and pain in feet and ankles. Staying on your feet for longer period often restricts blood flow and pool fluid to the feet. Even sitting for longer period can also cause this. Massage helps to encourage blood flow to the feet and improve circulation. Starting from the feet, move up to the knees while massaging. This will help to reduce swelling, pain and discomfort. Use mustard oil or any essential oil like chamomile and cypress oil for massaging. Use gentle yet firm stroke and massage in the direction of your heart. Not drinking enough water contributes to swelling. To avoid dehydration, body starts retaining water that contributes to swelling in feet and legs. Drink enough water and fluid throughout the day. This will help to hydrate the body tissues and help detox your body. Drinking water will help to dilute caffeine and sodium that are major contributors to inflammation and will be thrown out of the body, thus helping reduce swelling and soreness. Drinking ginger tea 2-3 times a day and massaging the feet with ginger oil can help to reduce swelling because ginger has anti-inflammatory properties. Ginger can help to dilute the sodium which is one of the major reasons of fluid retention and swelling. Try this remedy on a daily basis to get relief from inflammation and pain. Often magnesium deficiency causes edema, taking magnesium supplement or eating magnesium rich foods like nuts, seeds, dark leafy greens, soybean, avocado, fish, dark chocolate and bananas can bring relief from pain and inflammation. The recommended dose for magnesium is 350 mg per day. But it is best to consult your physician, especially if you are pregnant, before taking any supplement.